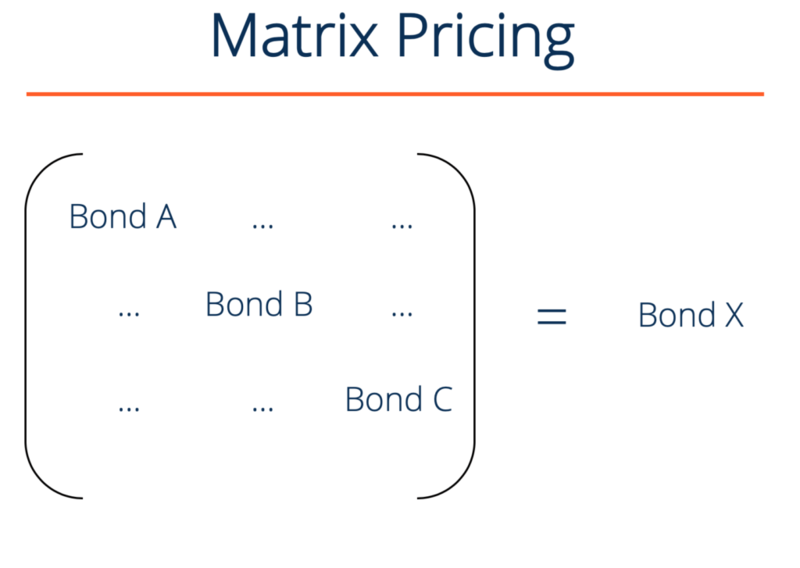 Matrix pricing is an estimation technique used to estimate the market price of securities that are not actively traded. Matrix pricing is primarily used in fixed incomeFixed Income SecuritiesFixed income securities are a type of debt instrument that provides returns in the form of regular, or fixed, interest payments and repayments of the principal when the security reaches maturity. These instruments are issued by governments, corporations, and other entities to finance their operations, to estimate the price of bonds that do not have an active market. The price of the bond is estimated by comparing it to corporate bonds with an active market, and that have similar maturities, coupon rates, and credit rating. This relative estimation process can be very helpful for debtDebtDebt is the money borrowed by one party from another entity to serve a need that otherwise cannot be met outright. Many organizations use debt to procure valuation of private companiesPrivately Held CompanyA privately held company is a company’s whose shares are owned by individuals/corporations and that does not offer equity interests in the company to investors in the form of stock shares traded on a public stock exchange, nor is it owned by a government. A company in the "private sector" refers to non-government-owned, which typically don’t report as much information as public companiesPublic Company FilingsA financial analyst has to search for public company filings, financial statements, reports, and other company information. Here are ways to find them. Another use of matrix pricing is for bond underwriting, which can be used to estimate what the market’s required rate of return on the bond will be. Yield to Maturity (YTM) is the total expected return from a bond if the bond is held until maturity, i.e., until the end of its lifetime, and all coupon are reinvested at the same rate. Couponi is the coupon payment received by the bondholder at period i. Face Value is the amount on which the coupon payments are calculated. Bond Price is the market price of the bond. 1. Calculate the yield to maturity of Bonds B and C.
2. The estimated market discount rate of the 6-year 10% bond is the arithmetic mean of YTMB and YTMC. Therefore, YTMA = (11.46% + 1.74%) / 2 = 6.6%. An alternative method to calculate YTMA is to take the geometric mean of YTMB and YTMC. The estimated market price of Bond A based on Bonds B and C is $116.41. The estimation method is called matrix pricing because it uses a matrix like the one shown above. Equity vs Fixed IncomeEquity vs Fixed IncomeEquity vs Fixed Income. Equity and fixed income products are financial instruments that have very important differences every financial analyst should know. Equity investments generally consist of stocks or stock mutual funds, while fixed income securities generally consist of corporate or government bonds.